After announcing to her Instagram followers, "Yes, he broke my heart," Kris Aquino went on to change her IG username to @lovelovelovekrisaquino. This was becase while the "he" she was referring to made her cry, she was grateful for the thousands of fans who have been rooting for her since she started her search for Mr. Right decades ago. In case you’re wondering, the "he" whom Aquino mentioned is Quezon City Mayor Herbert Bautista. The two had a very brief relationship. One day Aquino was saying they were a "work in progress," then suddenly it was "work cancelled." But if there’s anyone who can bounce back from a heartbreak, it’s Aquino. 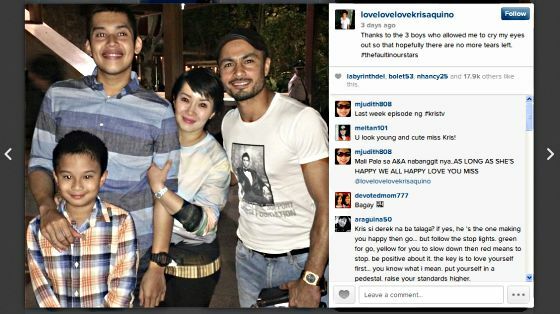 Three days after she posted her June 12 heartbreak post on IG, she posted a photo of herself and her "movie dates." As you can see, two of her dates are her sons, Josh and Bimby. Then, there’s actor Derek Ramsay. She had typed this caption: "Thanks to the 3 boys who allowed me to cry my eyes out so that hopefully there are no more tears left. #thefaultinourstars." Of course, Aquino and Ramsay are going to say they’re just friends...but who will believe them? Besides, they were rumored to be going out before she revealed that she was with Bautista.